Governor Margaret Alva said today that a bank for women should be established in the state that charges realistic credit from women borrowers and added that Uttarakhand was a fit case for establishing such a bank. A former housemaid and now a Bengali author of repute, Baby Halder has come a long way. Penning her travails in the autobiographical “Aalo Andhar” has given her national and international fame. The book has been translated in 25 languages. “I found my moorings when I began writing. A child prodigy, Ustad Shujjat Hussain Khan started playing the sitar at the age of three under the watchful eye of his father and guru, the legendary Vilayat Khan Sahib. 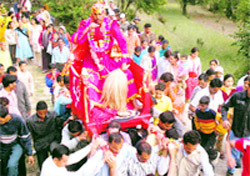 Residents of Chamdeval area of Champawat district thronged the ancient temple of the deity Chamu today as three-day Chaitol festival got under way. “During these three days, we worship the deity Chamu and offer our crops and other household pleasures to the deity,” said Anand Singh Dhoni, chairman of the mela committee. The Jagriti Yatra dedicated to the unity of the Khalsa Panth reached Dehradun from Biharigarh today. It received a grand welcome here. The devotees at the Patelnagar gurdwara showered flowers and distributed prasad to the members of the yatra. After this, about 250 devotees on vehicles conducted ‘shabad gayan’. Rudyard Kipling’s famous line “never look backwards or you’ll down the stairs” resounded on the premises of Delhi Public School (DPS) as the angelic buds of tiny tots geared for their prize distribution and graduation ceremony, “the little wonders of tiny tots”. ICFAI National College, on behalf of ICFAI University, Dehradun, bade farewell to all its students of BBA 2007-10 batch here today. Sixtyone students successfully completed the programme and passed out from the college. 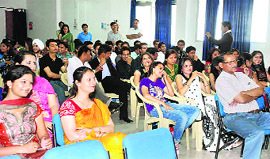 Students of BBA of ICFAI National College at their farewell party on Friday. A state-level training for homoeopathy physicians on mother and childcare got under way in Doon. At least 50 doctors are participating from different districts of the state. The ruckus over the hoarding policy of the Dehradun Municicpal Corporation (DMC) is not coming to an end. A fresh chapter has opened with BJP councillor Sachin Gupta creating noise over the Mayor’s arbitrariness in sending the proposal to the Secretariat without consulting the councillors. Rejecting pleas of green activists, the ONGC has given a go-ahead to its proposed felling of 151 green trees in its Kaulgarh-situated fire service station campus to make way for shifting of its gas godown. 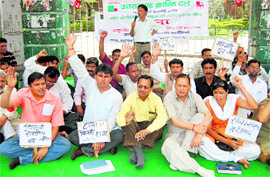 The city wing of the Uttarakhand Kranti Dal (UKD) protested against shortage of electricity and water in the city. Bahadur Singh Rawat, city president, said when main rivers like the Ganges and the Yamuna passed through the city then there should not be any shortage of water or electricity produced through hydro-projects. The Nirbal Varg Jan Kalyan Samiti, headed by its state president Ratan Mani Nautiyal, senior councillor and general secretary Raj Kumar and founder member Virender Mohan Uniyal submitted a memorandum to the District Magistrate apprising him of various problems faced by slum dwellers in the city. Continuing its winning spree, ICL College, Haryana, registered another easy win over NSCC, Rishikesh, by nine wickets during the IIIrd All-India Uttarakhand Cup underway on the Rangers College Ground here today. Rajesh Kumar’s unbeaten knock of 73 runs today helped the Indian Institute of Petroleum (IIP) getting past the Forest Research Institute (FRI) by 15 runs on the second day of the Central Government Employee Welfare Coordination Committee (CGEWCC) Cricket Tournament being organised by the Survey of India at its cricket stadium here. In a closely contested match, the PCA, UP, eked out a narrow one-run win against Doon College, UP, in a Twenty20 match during the ongoing Uttarakhand and UP Real Host Cup Cricket The tournament is being organised by the Uttarakhand Youth Twenty20 Cricket Association in Biharigarh here today. “I am hopeful that the state government will take up this project, the experiment here could also be emulated in other parts of the country,” said Margaret Alva. She was speaking at a seminar titled “Sangharsh aur Shrijan” organised today to mark the birth anniversary of Hindi poetess Mahadevi Verma. 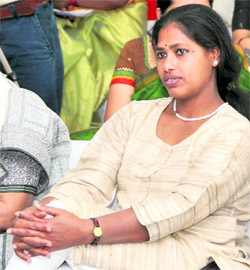 Alva said when the idea of giving reservation to women in Panchayats and Parliament was first mooted, several men leaders and bureaucrats thought it was a western idea but, “we were sure that only way the women could be empowered was giving them a place in the Panchayats and Parliament where all laws that affect women are framed by men,” she said. She called upon the hill women to become members of federations and look for avenues that financially empower them. “I would also request you to be considerate towards daughters and daughter-in-laws, as most of the injustice heaped on them can be stopped if women become considerate towards them,” said Alva. The Governor also noticed the absence of male officials especially Secretary, Women Empowerment, Rakesh Kumar and quipped that men usually kept from such meetings but they would continue to speak no matter what. On the occasion, Geeta Gairola, Director, Mahila Samakhya, said Mahadevi Verma was the greatest feminist but her peers and intellectuals at time failed to shed light on this aspect of her personality. “We at Mahila Samakhya by celebrating her birth anniversary want to shed light on this aspect of her personality so that women residing in the remotest corner of the state become aware of the feminist streak in her and become inspired,” said Gairola. Demystifying the personality of Mahadevi Verma, Dr LS Bhatrohi, Director, Mahadevi Sarjan Chair, said it was only a few years back that attempts were made to study other aspects of her personality. “She continued to be wrapped in an image that was not of her making and it refused to leave her during her lifetime. She was more than a poetess of pathos, a truly feminist who chose education over her husband,” said Batrohi. Jaya Srivastav, a woman writer, said Mahadevi Verma lived life fully and on her own terms. “The steadfast approach allowed her to live life the way she deemed fit,” she said. She called upon enlightened women to be compassionate towards their sister and said the women’s movement would not have been what it was today but for the efforts of Asghari Begum, Meera Bai, Jhanara Begum and others. “They contributed in their own way. Meerabai had the courage to go against the prevailing norms and claimed a member from a low caste as her Guru, because she was confident and steadfast in her approach,” she said. On the occasion, “Na Mai Birwa Na Mai Chiriya”, a book carrying autobiographical excerpts from life and times of Baby Halder, Deepti Priya, Tehmina Durrani, Ramnika Gupta, Shantakrishan Kamble and Amrita Pritam among others, was also released. The process was immensely satisfying, but aftermath of the book, when unknown women approached me with saying it was their own story, was equally satisfying and rewarding,” said Halder. Today she was the in city to participate in a seminar organised by Mahila Samakhya. Halder, a native of Durgapur in West Bengal and now settled in Gurgaon, was married at the age of 13. “The marriage was forced upon me, we were incompatible from the word go. He was a small-time decorator whose approach towards me and my children was one of callous neglect. 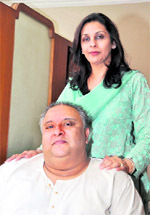 Things came to such a pass that I was forced to seek out a living in Gurgaon by working as a house maid,” Halder said. Luck favoured the class VII drop out, whose knowledge of faltering Hindi attracted ridicule, began working at Probodh Kumar’s house, a grandson of Munshi Premchand. Here the family members took interest in her well-being and encouraged Halder to pick the pen and that’s how the career of an erstwhile house maid was launched. Mother of three children, Halder is a popular guest at seminars and workshops. “I have rubbed shoulders with Medha Patekar and Arundhati Roy, they are in their own league but I love motivating women ensuring that the poor among them get inspired and work with a sense of purpose,” asserted Halder. Her second book “Eshat Roopantar” in Bengali too has been well received. “Living in Durgapur, I was poor and vulnerable, writing has given me confidence and it’s my calling now. I am able to earn well and provide for my family but for Probodh Kumar, who is like my father, I may not have come this far,” she said. Truly, the story of a former housemaid is an inspiration for all. He has never looked back since, carrying forward the finest tradition of the Imdadkhani gharana, Shujjat has over 60 music albums to his credit and one Grammy nomination under his belt. When The Tribune met him at a local hotel today, despite being travel weary, the ever gracious Shujjat relented for an interview though in between, he kept enquiring about the lunch meeting that had been fixed with friends. The enquiry took the form of an appeal made to his wife concerning the menu that had to be perfect for the guests. That done, he settled down for a chat. With satisfaction writ large on his face, the maestro said, “We are living in interesting times. I am quite impressed with the music scene in the country and around the world. Familiar notes of Hindustani classical music can even be heard in a quaint little European town though with little variation. “Our film music has always been popular, but it is not getting a worldwide audience. I think this is the renaissance period for Indian music. Several of our composers have managed to carve a niche and have a legion of followers even in Hollywood. Despite performing in more than 90 countries and his long stints abroad, Shujjat Hussain candidly admitted that even now he kept getting offers to teach abroad, but the craving for familiar surroundings prevents him from grabbing these. “The call of one’s motherland is more enchanting and its meaning gets more and more profound as one mellows with age. Food and waking up every morning in familiar surroundings matter a great deal now than ever before and I cannot be far from Delhi,” said the maestro. The torchbearer of the seventh generation of performers who started their journey from Kolkata, Shujjat Hussain is blessed with an incredible voice that he uses to sing folk songs and other ragas now and then. In fact, he admits that it is his vocal style that is similar with his father and guru Vilayat Khan. “We have the same blood and our vocal style too is the same, but the similarity ends there. Several influences have shaped me over the years. My long stint abroad too has been an eye opener. “The likeness with my father ends in the way I perform on the sitar. Now that I have matured, people can spot the difference in our approach to the ragas,” he said. A resident of Doon, his wife Parveen has studied at the local Convent of Jesus and Mary School. She had lived for several years in Rajpur when the city had not lost most of its green and abounded in thick forest cover. Ustad Vilayat Khan had a house in Doon that has now been sold. However the connection with Doon continues to this day and the maestro keeps coming though there are too few opportunities available here. 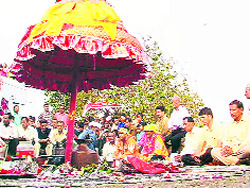 Residents of Chamdeval area of Champawat district thronged the ancient temple of the deity Chamu today as three-day Chaitol festival got under way. “During these three days, we worship the deity Chamu and offer our crops and other household pleasures to the deity,” said Anand Singh Dhoni, chairman of the mela committee. After the inauguration of the Chaitol festival in Chamdevel, persons from surrounding villages gathered to take the deity to their respective villages amid the performance of traditional cultural songs and dances by women. “This year, the festival witnessed a gathering of more than 10,000 people, mostly from outside this area,” said Dhoni. “The Chaitol festival in the Soar area of Pitthoragarh district will be held on 14th and 15th of the month of Chaitra,” said Khimanand Bhatt, local priest of the deity. Festivals related with harvest are in abundance in Indian society and be it Pongal, Bihu or Baisakhi, people of agrarian communities celebrate these festivals with enthusiasm. Before the rabi harvest, people of the Kumaon region, especially in the eastern districts, celebrate the festival not only as a mark of happiness for a bumper crop, but also as an age-old tradition called Bhotoli in which married girls get gifts from their parents or brothers. The villages of Pitthoragarh district get enveloped in a unique flavour of festivity on the occasion which is celebrated from the 10th day (dashmi) to the last day of the shukla paksha (waxing fortnight) in the month of Chaitra at various places in Gumdesh area of Champawat district and almost in all villages of Pitthoragarh and adjoining areas. An umbrella-shaped fixture with carvings of local deities is made with a log and colourful scarves are wrapped around it. After the umbrella-shaped device is erected, sacred ‘harela’ leaves are collected to worship the umbrella which is considered to be Bhumia devta (lord of the land). The sacred umbrella is then taken to every village where villagers in colourful attires worship it and seek protection of their rabi crop and health of their livestock. “This is a festival to not only remember the bond between sister and brother in traditional Kumaoni society, but also to please the local deity and seek his blessings,” said Mohan Singh Rawat, a senior citizen of Pitthoragarh town. “The Chaitol festival takes place in the Gumdesh area of Champawat district for the local deity Chaumu who had sent his two brave soldiers - Lata and Bharnara - to kill the devil who was sacrificing village youths,” said Anand Singh Dhoni from Baskuni village in the Gumdesh area. A characteristic feature of the Chaitol in Gumdesh is that ladies of a particular caste prepare rice ‘papad’. Menfolk are prohibited from this process. These ‘papads’, along with other preparations, are given to village girls who go in a group to the local deity to offer these preparations to him. In the villages of the Soar valley, the local deity Devalsamet travels to all 22 villages in which his influence might have prevailed in old times. “The Chaitol festival is celebrated to commemorate the tradition of Bhotoli. Devalsamet, the landlord of the area, goes to his sister Goddess Bhagwati’s home to give her gifts,” said Yaswant Singh Mahar, a social worker and journalist from Kumaor village. Besides him, some other deities in Satgarh, Bhurmuni, Majirkanda, Jakh, Kanalichina, Pali and Saun Patti areas also travel either in the shape of the sacred umbrella or embodied as a person who is called Dhami. “The story is the same in all these villages where the local male deity is considered the brother and the female deity is supposed to be his sister. The male deity gives her gifts,” said Har Govind Pant, a resident of Jakh Pant village. “This is a reflection of the times when the present agrarian community might have struggled to settle over here and faced the resistance of the local inhabitants who were neither agrarian nor from the same ethnic background. “The deities who are worshipped by the community were actually the brave persons who helped the agrarian community of the Himalayan region settle there,” said Madan Chandra Bhatt, a historian of the Himalayan region. “If we assume these deities to be landlords, then farmers might have got tax concessions when northwestern rain and hailstones damaged their crops and hit their livestock,” said Bhatt. Dr Ram Singh, noted social historian of the area, had a different point of view. “In old times when there were tribal groups, the mother of the clan happened to be the head of the clan. Before the Khas settlers came into the Soar valley, these mother goddesses were dominant in the entire Himalayan region. “This Chaitol festival reflects their influence. Even after the mighty agrarian community settled in the area, they could not ignore these goddesses. The sacred umbrella goes to temples of some mother goddess in all 22 villages of the Soar valley,” writes Dr Ram Singh in his recently published book. The festival is welcomed by the village folk, specially the village women who get a chance to not only tell her woes to her beloved deity, but also an outing to meet her near and dear ones at the festival site. After a two-day ceremony with the beating of traditional drums (dhol-damau), the festival culminates at the temple from where it will be resumed next year. The Jagriti Yatra dedicated to the unity of the Khalsa Panth reached Dehradun from Biharigarh today. It received a grand welcome here. The devotees at the Patelnagar gurdwara showered flowers and distributed prasad to the members of the yatra. After this, about 250 devotees on vehicles conducted ‘shabad gayan’. 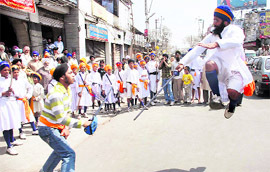 The Singh Sahiban were blowing a ‘nagara’ on the first vehicle and behind them was the ‘gatka’ party which enthralled the gathering with its performances. After having ‘langar’ at the Premnagar gurdwara, the devotees left for the Paonta Sahib gurdwara. Among those who welcomed the yatra were president Rajender Singh Rajan and vice-president Jathedar Daleep Singh. Urmila Verma, Principal of Delhi Public School, welcomed chief guest Jayshree Senthil, special guest Kiran Dubey, dignitaries and parents. Addressing the gathering, the Principal highlighted the achievements and core philosophies of the school. “DPS believes in imparting not only stress-free education, but also shaping all round individuals with a zest for learning, she said. The enthusiasm and conviction in her speech made each student and member of the audience give her a resounding ovation. Walking with Mogli, the famous jungle character, children of class I presented the story of the Jungle Book with such a style and élan that it left the audience spell bound. Energetically jiving on the music, the students of LKG took their parents back in time with their melodious medley of nursery rhymes. Rowing their boats gently down the stream, the students of UKG presented the enchanting world of aquatic dreams. However, the highlight of the day remained the graduation ceremony of nursery students, who walked up on the stage stylishly. Kiran Dubey, a renowned television personality and actress of “Kyuki Saas Bhi Kabhi Bahu Thi” fame, came from Mumbai to be part of the celebration. Jayshree Senthil, an IT scholar, also congratulated the children on their brilliant performance. Brig ML Sabharwal (retd), Principal of the college, congratulated the students on their success and wished them good luck for their future ventures. He commended the active participation of the BBA students in various curricular activities of the college. He also congratulated those students who had come out with flying colours over the three years of the programme. The Principal advised them on the merits of taking up full time postgraduate programme in management so as to enhance their skills for their career growth. He added dedication, commitment and the will to perform at the highest level should be the primary aim of every student. In his concluding remarks the Campus Head asked the students to keep ICFAI University’s mission “Learning for Leadership” at the back of their minds. The students of BBA IVth semester presented a cultural show especially prepared for the passing out batch. The function comprised dances and skits enacted by students of BBA-IVth semester. After the performances and formal farewell, the passing-out students were further enthralled by dance and music. The atmosphere was charged with the enthusiasm of students. Under Ayush, several national programmes are underway regarding mother and childcare. Making a beginning in 2009, a target was set to strengthen the homoeopathy mechanism in the country by 2012. A special kit with 22 medicines is being provided to ANMS and ASHA workers that can be given to pregnant and lactating women. Master trainers are being developed who will provide training at the district level. Various experts in the field of homoeopathy, pediatrics, gynaecology and nutrition participated at the workshop. The training is expected to enhance the skills of homoeopathic physicians in tackling problems of mother and be able to provide quality health care to all and reduce maternal mortality rate and child mortality rate in the state. Dr Pamita Uniyal, Medical Officer, gave a brief overview of the aims and objectives of the training and Dr Satish Pingal, Medical Officer, was the coordinator for the workshop. Today, Dr Archana Srivastav of the District Women’s Hospital gave a presentation regarding care of a newborn baby. Dr SK Sarkar from Kolkata, Dr Archana Srivastav, pediatrician, Doon Women’s Hospital, and Dr DP Joshi, pediatrician, Doon Hospital, participated at the workshop. The ruckus over the hoarding policy of the Dehradun Municicpal Corporation (DMC) is not coming to an end. A fresh chapter has opened with BJP councillor Sachin Gupta creating noise over the Mayor’s arbitrariness in sending the proposal to the Secretariat without consulting the councillors. He confirmed getting nod from 20 other councillors in taking the matter to the Secretary, Urban Development, a day after. Since the unregistered hoardings outnumber the registered hoardings, which are merely 266 out of a total of 1,000, the Mayor had given an ultimatum of one week to the unregistered hoardings. But that time limit too has passed and the DMC has not taken action against the cheat. To this, Mayor said, “We are taking note of defaulters, who are deeply entrenched between a difficult situation, where they either have to give an affidavit or come across as illegal. Sensing the alarming situation ahead, they have driven councillors to speak on their behalf and create an obstacle on the way”. Sachin gave different versions saying, “When I raised the matter in the board meeting held on December 29 about the lacunae found in the policy, I was assured before the full House that the policy would first be discussed with all members before taken to the Secretariat for the final approval. But now we have all been kept in the dark and the Mayor has sent the policy as final copy to the Secretariat”. The Mayor denied having made any such promise and said he had followed the board decision in letter and spirit. Fuming over the alleged betrayal, Sachin said, “Instead of giving hoarding rights to locals, the DMC has given the control to 10 big companies from outside the state. Secondly, reversing the old pattern of charging renewed charges from traders every succeeding year, the fresh system of distributing hoarding rights through auction will only encourage the hold of the wealthy and the mighty over small and petty traders”. Refuting the charges, the Mayor said the councillors had their own invested interests within the established system, and now dread losing it in the new set-up. “The old traders who indulge in hoarding business have become more of a mafia. I want to break their monotony and bring in the transparency which will also augment revenue in the DMC”. Throwing light on the concerns of the marginal trader, he added that the auction would be held on each hoarding which would give opportunity to even small-time trader. After having succeeded in getting permission of the Dehradun Divisional Forest Office, the ONGC has now asked the Uttarakhand Forest Development Corporation for expediting the conduct of the exercise for the felling of the trees. A letter to this effect was received at the office of Uttarkhand Forest Development Corporation, Haridwar Road, Dehradun, on Thursday. The Dehradun Division Forest Office recently gave permission for felling of these trees through its letter dated March 12, 2010. When contacted by The Tribune, corporation official DS Semwal too confirmed receiving a letter from the ONGC for felling as many as 151 trees in Kaulagarh. Much furore was created over this proposed axing of these trees by the ONGC early this year, following which the ONGC had shelved of the plan for the time-being. The letter received at Uttarakhand Forest Corporation Office had revealed the ONGC plans to go-ahead with the felling of trees in a guarded manner. It is noteworthy that the Institute of Drilling Technology (IDT), ONGC, plans to shift its godown and build it at the fire service station campus where at present, these trees abound, which involves axing of big number of trees. Residents and even some employees of the ONGC had been on condition of anonymity questioned the logic of destroying this green haven when some alternative arrangement could have been explored. “Exams are going on these days. The government should pay quick heed to reduce long power cuts in the city. Despite our repeated suggestions, Jal Nigam and Jal Sansthan did not do anything to launch any good plan to improve water situation in the city,” he said. Rawat also fetched attention to the deteriorating condition of sewerage in the city, especially at Patel Nagar and Sabji Mandi, which could prove to be a genesis of diseases like cholera and dengue any time. The city has already spotted a case of dengue. The other issue which the UKD protested about was the continuous contamination of small rivers like Bindal in the city, which has become a dumping ground for all kind of garbage in the city. “On one hand, we talk about saving the Ganga and the Yamuna, and on the other we are contaminating small rivers like the Bindal which ultimately joins these big rivers and pollute these as well. This has to be stopped immediately,” said acting president Virender Singh Bisht. Bisht also opposed the proposed house tax saying that the DMC should first take steps to provide the basic sanitation and other amenities to city residents than introduce the house tax schemes. BD Raturi, former president of the UKD, and other senior leaders like Arjun Singh Rawat, Kamlesh Bhatt and Rajender Singh also participated in the protest. Raj Kumar said: “All slum dwellers should be charged ownership cost at the rate of Re 1 per square meter each and be included under house tax on the pattern of 1989-94. The slums which have not been included for house tax should be charged 360 for kutcha houses and 500 for pucca houses”. An amount of Rs 2.5 crore announced by the Chief Minister for the development of slum colonies should soon be released. The ongoing projects should also be completed. He demanded adequate drinking water, electricity supply and distribution of ration cards for this strata of society. In 40-over match, NSCC won the toss and chose to bat first, but could play just half of the overs. The team was packed off for just 86 runs in 20.1 overs. It was Naveen for the ICL team who bowled a terrific spell claiming five wickets giving away just 11 runs in 5.1 overs to down NSCC. Mohit and Vickey also pocketed three and two wickets, respectively. NSCC’s Mukesh (27) stayed on the pitch for sometime and rest of the batsmen went to pavilion without making good runs. The ICL team had no problem to chase the target and finished the match in their favour with less efforts. It scored 90 runs in 13.3 overs at the loss of one wicket. Bhageswar (60) scored highest runs in just 41 balls. Azad of NSCC was the only successful bowler for the side. He got the wicket of opening batsman Amardeep. The IIP team elected to bat first after winning the toss in the 25-over match. The highlight of its innings was Rajesh Kumar’s 73 knock (not out). He was ably supported by Shiv Singh who played a valuable knock of 31 runs. Singh’s knock was not only significant for he scored 31 runs but also because he supported the star of the match Kumar from the other end. The IIP scored 75 runs in the allotted 25 overs losing its five batsmen. For the bowling side, Vishnu and Rajendera took two wickets each while Sunil got one wicket. In reply, the FRI could score 157 runs at the loss of nine wickets in the allotted overs. Manoj (23), Rajendra (21), Narendera Mehta (18) and Sushant Upreti (17) though started off well but failed to convert their individual scores to big numbers. Shiv Singh and Parvez Alam scalped three wickets each and Rajesh captured two wickets for the IIP. Batting first after winning the toss, the PCA scored 99 runs before getting all out in 18 overs. Opening batsman Usmaan (24) was top scorer for the team. Maninder (13) and Adesh (13) also chipped in. For Doon College, Anuj claimed three wickets, Chunno and Mannu two each while Johny and Sonu got one each. Doon College gave a tough competition to its rival but fell short of one run of scoring 99. Amit (17) and Mannu (14) were the main scorers for the side. For the PCA, Ajay and Naeem did the maximum damage claiming four wickets each. Vishavdeep took three while Rohit and Rakam captured two wickets each. 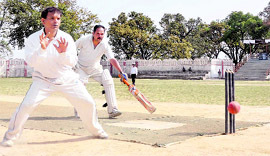 Meanwhile, in the second match, Rajendra Sports defeated UP star by 49 runs. The winning team had scored 112 runs while UP star was bowled all out for 63 runs.